I&D is proud of our ongoing partnership with True Zero (a FirstElement Fuel brand) the owners of the world’s largest network of hydrogen fueling stations for retail consumers. I&D’s development team works hand-in-hand with True Zero (a FirstElement Fuel brand) to develop the hydrogen stations in record time! I&D understands the importance of cultivating relationships with local jurisdictions throughout the entitlement & permitting process to ensure an expeditious review and approval of hydrogen stations. I&D’s expertise in the development process has helped FirstElement be successful in their rapid deployment of new stations across California. Snapshop of FirstElement Fuel, Inc.
FirstElement Fuel Inc. (FEF) is a privately held California-based C-corporation established in 2013. FEF builds, owns, and operates hydrogen stations with a first and foremost focus on the customer. Largest company in the world fully dedicated to selling retail hydrogen for mobility. Opened 19 retail hydrogen stations at an unprecedented speed starting in Fall of 2015 and have an additional 12 stations in the development phase. FEF launched its True Zero brand, which has become synonymous with a superior customer experience. 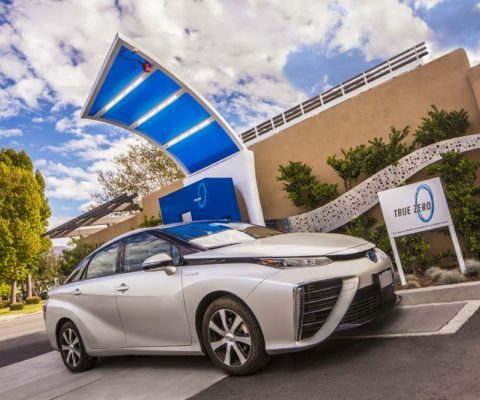 FEF laid the groundwork for Toyota and Honda to be able to sell fuel cell cars into the California market. Over 5,000 hydrogen powered cars on California roads today. 2017 & 2018: Project Management of 12 new California stations through site selection, entitlements, permitting, dry utility coordination and construction. Posted in All and tagged FirstElement, fuel, True Zero.